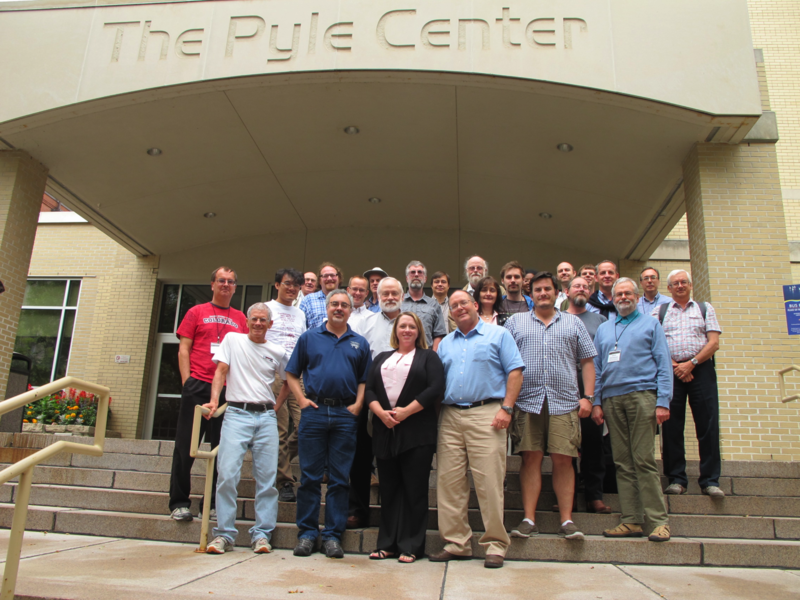 Saturn Science Conference attendees. Photo credit: Kevin Baines. Scientists at the Space Science and Engineering Center (SSEC) at the University of Wisconsin-Madison, and other authors of “Saturn in the 21st Century,” a book set to be published by Cambridge University Press July 2016, met to discuss the depth and range of developments in Saturn research at the Saturn Science Conference held in Madison August 4-7, 2014. Conference Chair Kevin Baines, a researcher with SSEC and NASA’s Jet Propulsion Laboratory at the California Institute of Technology, summarized “the future exploration of Saturn” on the final day of the conference, by giving a timeline for the before, during, and after the Cassini-Huygens mission. Cassini-Huygens is an unmanned Saturn-observing spacecraft launched by NASA in 1997. While the Cassini mission is expected to conclude in late 2017, future missions and probes are likely to take decades to launch. This gap poses a problem for those wishing to study Saturn — although there are several ongoing projects around the globe, such as NASA’s proposed New Frontiers Saturn Probe and the long-term Cosmic Vision from the European Space Agency. To circumvent this foreseeable lapse, Baines emphasized reliance on ground-based facilities, to view the planet from Earth using telescopes, instruments, and imaging technology. “We need to look at what we should do, what we can do, from the ground,” he said. In some cases, though, probes are the best way to go. Baines explained that, to find elemental abundances—the amounts of noble gasses, methane, or carbon, for example, that are present — on Saturn and Jupiter, they need probes, or perhaps specialized balloons in the future, since those molecules are located far within the planets and their atmospheres. This need is something scientists learned from the Galileo Mission, specifically, the Galileo Probe dropped off by its Orbiter, which orbited Jupiter in the 1990s and into the 21st century. It takes more than getting below the clouds to measure the composition of the atmosphere, Baines said. For example, probes have a hard time sending out signals from the “sweet spot” below Saturn’s clouds where gases are uniformly mixed and can be measured accurately. On Saturn, a cold and relatively low-gravity planet, clouds form at much greater depths than, say, Jupiter, and radio-absorbing gases are abundant. 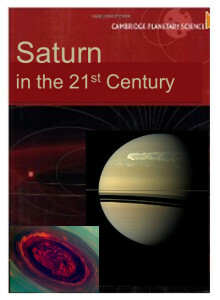 Currently, the scientific priorities in Saturn research, said Baines, are (in order, with some leeway) gravity, the planet’s magnetic field, thermosphere composition, and turbulence and small scales, each of which has a specific instrument in place to study it (RSS, MAG, INMS, RADAR, and ISS, respectively). Saturn’s ionosphere, internal magnetic field, Aurora, and lightning are other major areas of interest. Overall, Baines’ talk provided an opportunity for conference-goers to get updates, ask questions, and share techniques with other members of the planetary research community. In one instance, in a conversation about the Saturn Atmospheric Entry Probe Mission, pushed back to 2033, attendees troubleshot possible drawbacks of the probe entering on Saturn’s night side, the side facing away from Earth (for one, observers on the ground would not be able to see it go in). While mostly populated by scientists who study Saturn, the conference was also open to the public, and amateur observation by citizen scientists was emphasized in some of the talks. For example, in 2009, citizen scientists saw a small asteroid collide with Jupiter, according to Baines. Amateurs were also the first to observe the eruption of the Great Storm of 2010-2011, the largest-ever single convective storm, he said, and their images were crucial to understanding the storm’s early development. Baines concluded that numbers in the amateur community, and the quality of their work, is expected to grow, thanks in part to newer, better cameras and other technological improvements.